What looks like a donut but isn’t fried? This baked donut recipe! These delicious cake mix donuts are perfect for when you want a tasty treat to satisfy your sweet tooth. Scroll down to the bottom of the post to see a video of the donut making in action! You’ll see how easy they are to make. Who here loves donuts (raises hand)? Me!! It’s hard to find someone who doesn’t love donuts – but it’s also equally as hard to find someone who has a fryer at home. I personally don’t have a fryer, and I have no interest in dealing with oil. That’s where this baked donut recipe comes in. 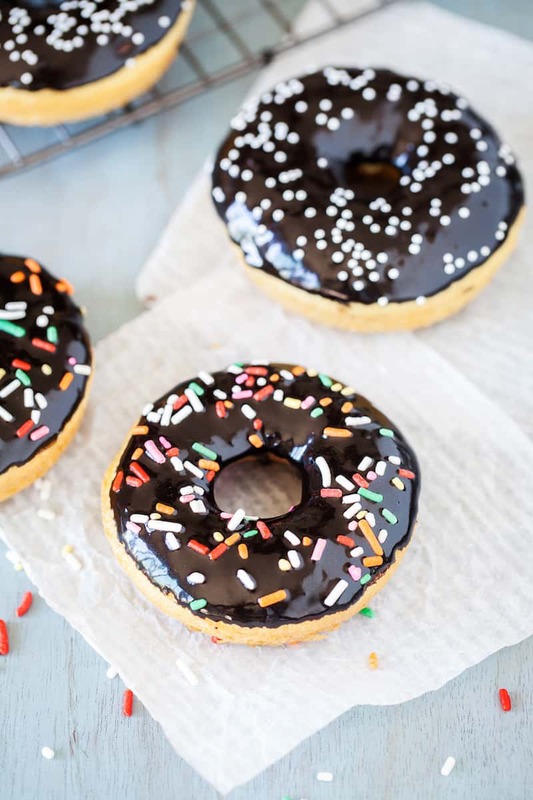 These baked donuts are made with cake mix! Can you believe it? I suppose technically the fact they are baked instead of fried makes them something other than donuts, but I’m going with it given the fact that they are doughy, round (with a hole in the middle), and frosted. Looks like a donut to me. The nice thing about these donuts is that once you get the cake mix, you likely have everything else in your cabinet to make them. There’s no firing up a fryer and using gallons of oil. 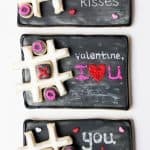 Your kids can help make these as there are minimal ingredients. 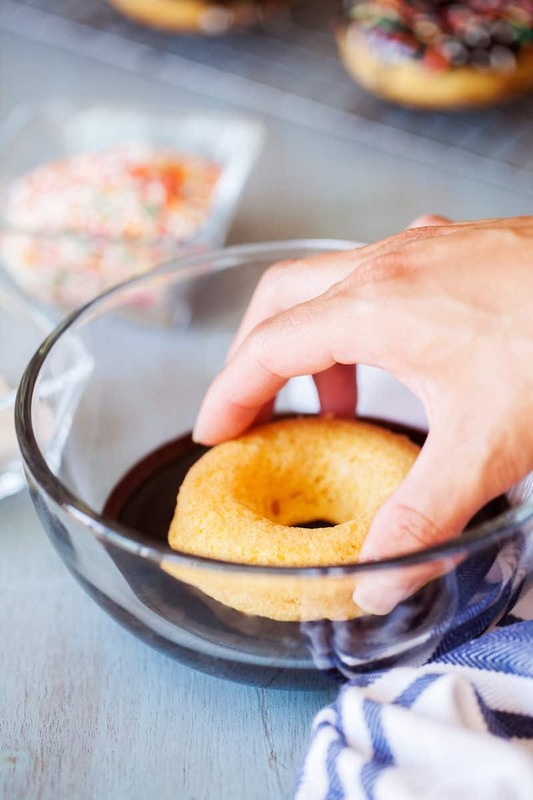 I really love how easy these baked cake mix donuts are to make! 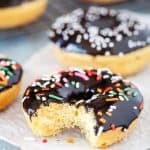 How Do Cake Mix Donuts Compare to Fried? I’m not going to say that these take like Krispy Kreme because they don’t. Yet they are delicious in their own right! I actually don’t love fried foods as much as I love baked, so these are perfect for me. They are a bit more dense than original, fried donuts. The consistency is a slightly different overall but ultimately, you’re going to love them. Especially with the frosting. Mix all the ingredients together in a medium size bowl until combined well. Take a Ziploc bag, fill it up with the batter, and cut off a corner. 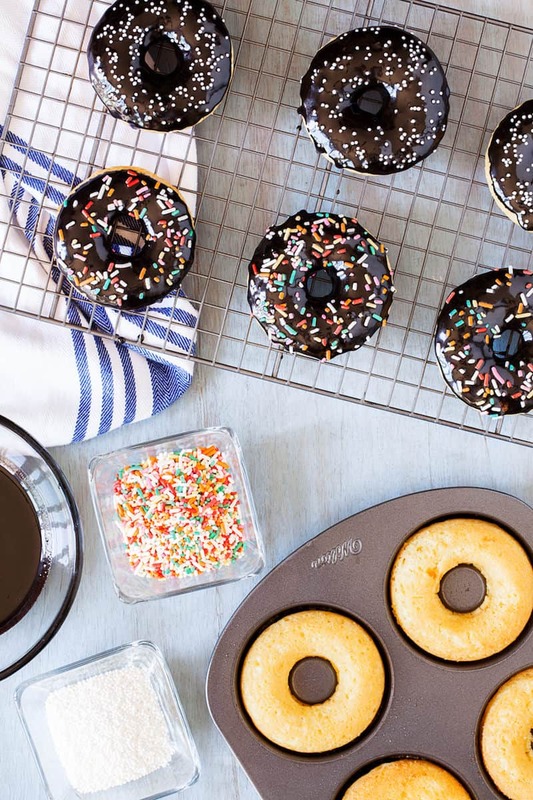 This next step to your cake mix donuts is easier with a donut pan . . . but if you don’t have one: I saw this cool trick from Pretty Providence. You’ll use a muffin pan. 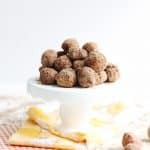 Roll small pieces of foil into about 1/2 inch balls and place them into the center of each cup then spray the entire pan with cooking spray. Take your batter and pipe around the foil ball. You’ll fill about halfway but you can use less if you want them to really look like donuts. Bake at 350 degrees for about 15 minutes or until golden brown. Allow to cool in the pan for 2-3 minutes. Remove the donuts from the pan and place on a cooling rack for about 5-10 minutes. Now while you wait for them to cool, make your glaze. Mix all the ingredients for the glaze in a medium bowl. Then dip the donuts and return them to the cooling rack. Add some sprinkles to the top if you’d like. As you can see, it really didn’t matter that these little babies weren’t real donuts. This baked donut recipe is such a cute mini wannabe version that I just had to gobble them up. If you want to make these for the holidays, add appropriate colored sprinkles or jimmies. No one will know they aren’t “real” fried donuts! They’ll be asking you for your recipe and will be surprised when you tell them they are baked donuts using cake mix. 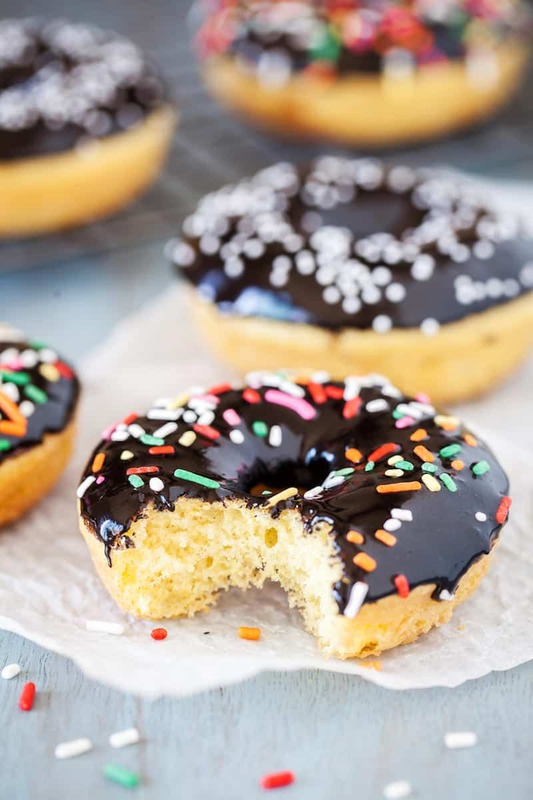 What looks like a donut but isn't fried? This baked donut recipe! These delicious cake mix donuts are perfect for when you want a tasty treat to satisfy your sweet tooth. Mix all the ingredients together in a medium size bowl until combined well. Take a Ziploc bag, fill it up with the batter and cut off a corner. This next step is easier with a donut pan. 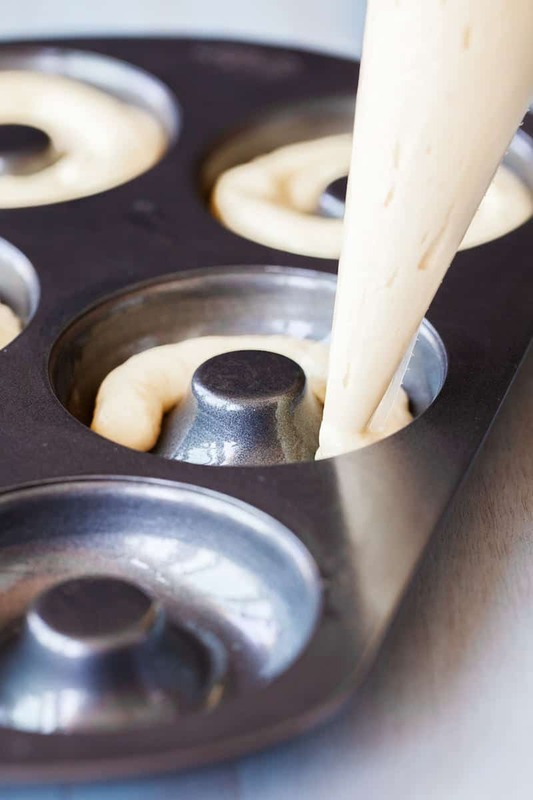 But If you don’t have a donut pan, use a muffin pan. Roll small pieces of foil into 1/2 inch balls and place them into the center of each cup. Spray the entire pan with cooking spray. Take your batter and pipe around the foil ball. I filled mine about halfway but you can use less if you want them to really look like donuts. Allow to cool in the pan for 2-3 minutes. Remove the donuts from the pan and use your thumb to slide the foil all the way through the bottom. Place on a cooling rack for about 5-10 minutes. While you wait for them to cool, make your glaze. Mix all the ingredients for the glaze in a medium bowl. Dip the donuts and return them to the cooling rack. Add some sprinkles to the top if you’d like. 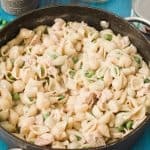 Lightened Up Tuna Pasta Recipe Everyone Will Love!